After several incredibly full-on days in Antarctica, we headed back across the Drake Passage en route to the Falkland Islands. 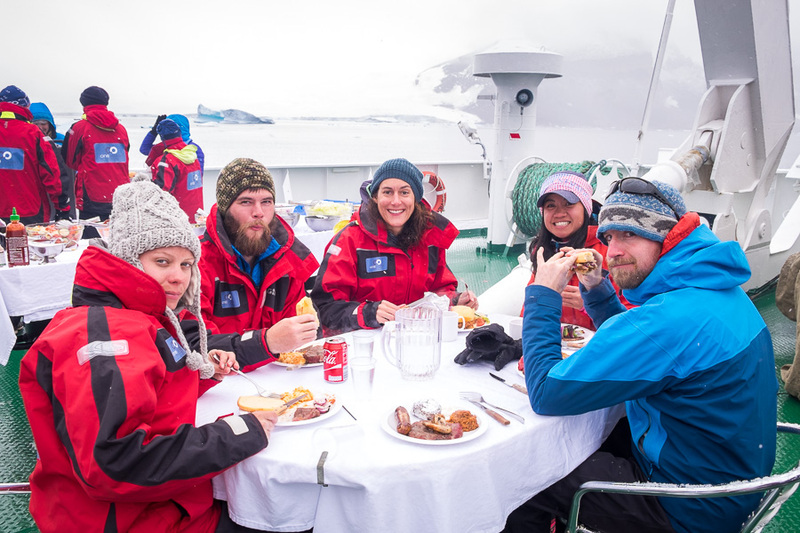 Not much to do over these couple of days so the crew put on a lot more talks and social activities, including an auction to raise money for several Antarctic charities, and a tour of the ship itself. This took in an explanation of the bridge and navigation room, the scientific equipment in the mudroom, the emergency steering controls and the engine room. I submitted a few photos to the on-board photographic competition, and these ones made the finals (as selected by the on-board photographer). Had never done anything like this, and I have to admit it was quite satisfying to hear the on-board photographer praise my images, and the gasps from the crowd as the two bird photos were shown. Several passengers also came up to me afterwards to say how beautiful my images were. I ended up winning the Wildlife category with the Skua picture – many thanks to the clap-o-meter and my fellow passengers 🙂 Very happy about that as I’d been eyeing off the One Ocean beanie in the gift shop, but it was quite expensive. Guess what I won?! Ate waaaaaaaaaay too much icecream at the icecream buffet at dinner on Day 10 – in fact have eaten waaaaaaaaaay too much food in general on this expedition, a fate we have all suffered! Need to get off this ship! Over lunch we motored from Cape Lookout to Point Wild, with some more amazing whale sightings against incredible backdrops. Point Wild is a narrow spit of land where Ernest Shackleton left 22 of his men from the Endurance under the command of Frank Wild, while he and 5 others sailed off to South Georgia Island to get help. Wild and the men managed to survive there for 4.5 months heading into winter awaiting their rescue. Again, the One Ocean crew were keen to manage expectations, almost guaranteeing us that we would not be able to leave the Vavilov, but to be prepared with binoculars to see the monument erected by the Chilean Government to commemorate the Chilean captain who ultimately rescued Shackleton’s men back in 1916. But when we got there, the weather was gorgeous and the swell was not too bad. The Expedition Leader did a test launch of a zodiac and decided it was safe enough – so for the first time ever for all but 2 of the One Ocean crew, and in a very, very rare opportunity for Antarctic visitors, we set out in the zodiacs to explore Point Wild. The primary focus was to visit the memorial to the Chilean captain, which turned out to be well guarded by a colony of Chinstrap penguins. Over the past 100 years, the beach where Shackleton’s men survived has essentially disappeared, and it was also high tide, so we couldn’t actually land. But we certainly spent a great deal of time contemplating how miserable it must have been to be stranded on this small spit of land in front of a massive glacier in the middle of the Antarctic winter, with no guarantees of rescue. Surprisingly, all 22 men survived this ordeal – I can’t imagine the strength of character required to do that! Leaving the monument, we explored a little further afield in the zodiacs (again, all new for most of the crew) including the very impressive glaciers, the really cool geology, and some more Chinstrap penguin colonies. It really was an incredible experience – again made more special due to the genuine excitement of the crew. Exploring Point Wild by zodiac. Amazing conditions! We’ve really had incredible weather this trip and have been very, very lucky. Fingers crossed it continues for the Falkland Islands once we have re-crossed the Drake Passage over the next couple of days! We were warned often and well in advance that what we may or may not be able to do today was very, very dependent on weather conditions and swell – and so to be prepared for worst. Elephant Island (part of the South Shetland Islands) basically sticks out into the Drake Passage and has no shelter, therefore it is often only possible to do a short zodiac cruise at Cape Lookout (our first excursion) and not leave the Vavilov at all at Point Wild (our second stop). Elephant Island is a very cool and craggy place – when you can see it. Many of the One Ocean crew had only seen it as a thin strip of brown hidden below massive amounts of cloud, apparently today was a very good day! We loaded into the zodiacs and started the excursion by following some Humpback whales south for a bit. The whales led us past where the zodiac cruise usually goes, which is when the One Ocean crew became super-excited. They had never been to this more exposed side of the Cape Lookout before and kept remarking that they had never seen it so calm. So, Expedition Leader, Nate, decided we would take the opportunity to explore this uncharted territory. And it was really amazing! For a start, the geological structures were incredible. We brought our tally of penguin species to 4 for the trip (out of a potential 7) by finding a good-sized Macaroni Penguin colony. makes a lot more sense! We also found another Chinstrap penguin colony, and could even land on the beach near the colony. 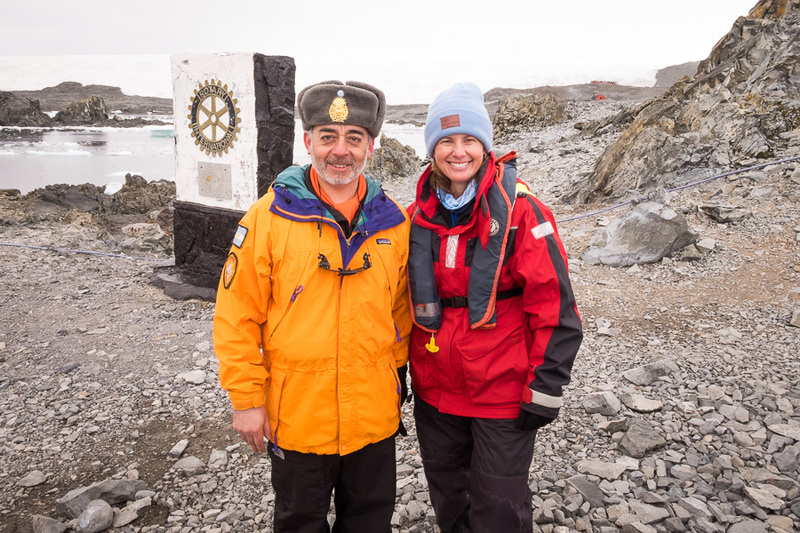 Apparently, they have never landed on Elephant Island before – so this was an absolute first! 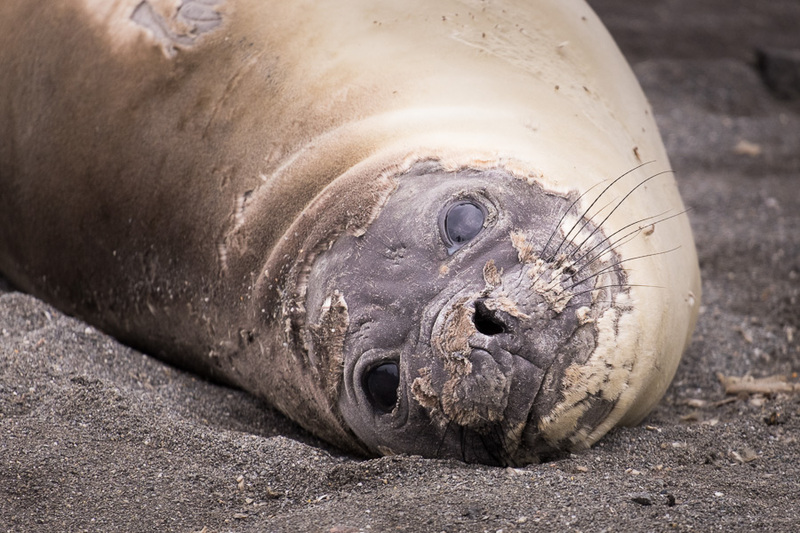 In fact, there were plenty of Elephant seals and a few Fur seals lounging around on the beaches in this area. Also got a first look at a krill – the food on which the majority of the Antarctic species feed. After first exploring the “unknown” area, we then did a shortened version of the regular zodiac cruise. I’m sooooo glad we got to see the other side, as the regular side was nowhere near as interesting! The Macaroni penguins on this side were a lot further away and the geology nowhere near as cool. We really, really lucked out! Last night I almost fulfilled one of my bucketlist items – I almost saw the midnight sun. I say almost, because at the latitudes where we are, the sun does actually set briefly, but I definitely stayed up to see the midnight twilight 🙂 Here’s the proof – a picture of Rosamel Island, the entrance to the Weddell Sea, taken at midnight. Easier day today, spent mostly on the Vavilov cruising around the Weddell Sea looking for “big birds” – ie Emperor Penguins. Absolutely gorgeous day with blue skies and very little wind during the morning – so wonderful to be out on decks enjoying the views. Unfortunately, not much wildlife at all, and definitely no Emperor Penguins, though we sailed as far south as we could before the ice turned us around (it was always going to be a long shot). Had a relatively short, late afternoon landing on Joinville Island, underneath Durville Monument at a large Adelie Penguin colony (with Gentoos thrown in of course). Again, only the second time any of the crew had visited the site – it is not well known and often difficult to get to. And it’s not only Gentoos that are sitting on eggs at the moment. The Adelies have an extremely short breeding season and we managed to catch them right at it. Back on the Vavilov and it was time for another hot tub before dinner. And then a back-deck party (with buttered Rum) to watch the ship’s progress through the huge tabular icebergs that crowd the Antarctic Sound. These icebergs are up to 20 metres high (much taller than the Vavilov) and very impressive. And the light was incredible! Yes – the days are very full here on the Valivov (another 11:30pm night), but great fun 🙂 The One Ocean crew were saying the other day that this is the youngest crowd they’ve ever had by percentage of passenger numbers, so I think they are having a lot of fun with us as well. After leaving Esperanza Station and yet another amazing lunch, we continued to be lucky with the swell and the ice, and could actually land at Brown Bluff – a site with another Gentoo Penguin colony and an Adelie Penguin colony – something like 90,000 nests in total! Here I saw lots of Gentoo chicks – the One Ocean staff are really surprised to see them this early, usually they don’t hatch for another week or two apparently. Simon (the One Ocean bird expert) also found a Snow Petrel in a cave and set up a scope so we could all have a close look. And we got to go for another hike – this time up the glacier for a great view down over the bay. It was nice to do a bit of exercise again, but the problem with the hiking is that because we have on so much wet/cold weather gear – you are positively boiling if you end up hiking uphill, like we did in this case. Admired the view and the incoming snowstorm for a bit and then slid down the first part of the hill rather than walking – much faster! Back on the Vavilov, it started to snow lightly, but without wind so it was actually quite beautiful. And it turned out that dinner was an Argentinian BBQ out on the back deck … yes, in the snow. They turned up the 70s and 80s tunes, had mulled wine to hand, and we had a great (if cold) time eating out in the snow as we headed towards our next destination. Unfortunately, the snow meant that we couldn’t go camping 🙁 but we ended up with something even better. A most amazing Orca and Minke whale show! There must have been at least 30 whales around us for over an hour, and the capitan of the Vavilov was awesome, driving the ship in circles so we got to enjoy the show for longer. Most of us were out on the bow of the ship, and it would have been funny to create a timelapse of the movement of people out there as there were gasps and exclamations from one side of the ship and then the other. There were so many whales, you really didn’t know where to look! And several of the whales swam right beside and/or under the boat – and we could see them in the crystal-clear water of the Antarctic. No blood or carnage though (usually Minkes are food for Orcas), so the naturalists on board were not sure as to why the Minkes and Orcas were hanging together, though one suggestion is that the Orcas had already attacked and eaten. Up at 7:30am for yet another bacon and egg breakfast (loving it – though there is a vast array to choose from on the breakfast buffet) before heading out to an Argentine Antarctic Base – Esperanza Station. Another amazing overcast day with no wind, and the approach to the base before breakfast was awesome – lots of icefloes with Adelie penguins – and gorgeous, gorgeous scenery! We were welcomed to the base by Lt Coronel Miguel Ángel Vázquez, the base commander, who then gave us a complete tour of the base, translated by Joao from the One Ocean crew. This base is unusual in that it allowed women to give birth there from the 1950s to the 1980s (there were 8 children born there until they discontinued the practice), and to this day they have a “family” approach (ie the people who work at the base can bring their families as well), as they are stationed there for 12 months. For this reason, the base has a school (kindergarten and primary school are taught directly, secondary school is done online), which was one of the stops on our visit. Tea, coffee and bikkies at Esperanza Station. Lovely welcome for us! The base also respects its history and location with a recreation of the stone hut in which 3 shipwrecked men survived back in 1903 until rescued, old machinery and sleds from the establishment of the base back in the 1950s, and an extensive museum. While we were in the museum I got chatting with the Base Commander about Antarctica and Latin America and how much I loved these places. Had a great chat for about 15 minutes before we had to continue the tour, but he specifically came up to me later and invited me come along with the film crew to his house where they were going to do an interview with him and his family. Of course! So got to peek into what one of the base houses looks like (reminds me of the houses in the recinto of Cerro Tololo Interamerican Observatory in La Serena), meet his wife and daughter and hear what they had to say about family life at the base during their year in residence there. 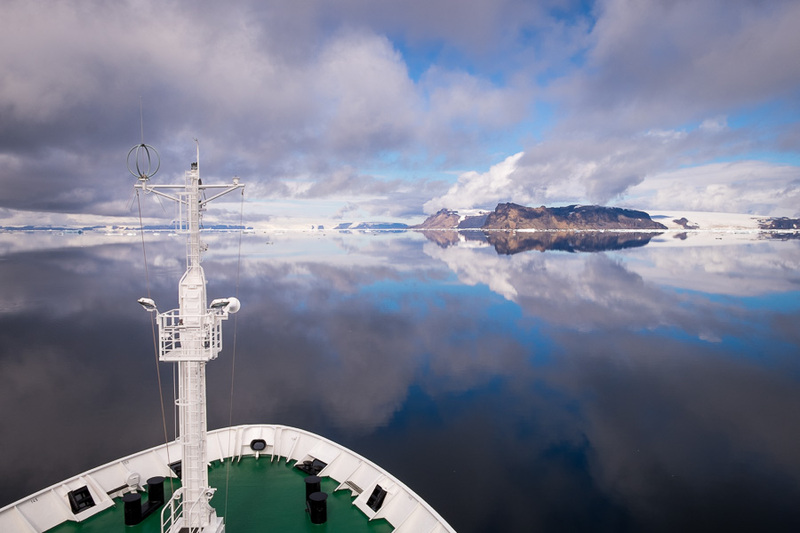 The One Ocean crew were super-excited that the weather was calm, as it looked like we would be able to get to Spert Island – one of their favourite places on the trip. This is a volcanic island that is quite exposed and therefore difficult to access in zodiacs. Quite often, and although they have this on the itinerary, it is simply not possible to do it. We passed some massive tabular icebergs as the Vavilov made its way from Mikkelsen Harbour to Spert Island over lunch (yes, we eat a lot on this trip). And the crew were saying that Spert Island is one of the places where icebergs to go die. They get trapped between the volcanic outcrops and end up smashing themselves to smithereens – something I can totally understand given our experiences in the zodiacs in calm weather! Spert Island is volcanic in origin, and therefore very unusual for the Antarctic Peninsula. However, this makes it all the more impressive with the dark cliffs rising straight out of the ocean to form incredible canyons. Although today was relatively calm, the swell was still large and several of the canyons were blocked by icebergs, so we poked the nose of the zodiacs into cool places and then sometimes entered, sometimes retreated, depending on what we found. You wouldn’t want to be doing this in a much bigger swell! The One Ocean crew are absolutely fantastic though. They are constantly joking around and having a good time, including on the walkie-talkies while we are out in the zodiacs, but they are absolutely professional as well. They clearly love their jobs and are great friends – which makes a trip like this really relaxed and awesome fun. I want to work with them! As we pootled around in the zodiacs (well, to be honest it was a fair bit rougher than that makes it sound), we saw the biggest icebergs to date. Huge Icebergs – gone to die at Spert Island. For scale, you can just make out the zodiac at right of the iceberg! And caves carved out of the volcanic rock which made for spectacular vistas. Spert Island was amazing to explore in the zodiacs – we were very lucky!